Here's your chance to experience the 'Campy You'. We offer participants a choice of both land and water activities that will be sure to add a fun summer camp 'spirit' to your weekend. Plus, we have some rejuvenating yoga sessions for your added relaxation. Enjoy! 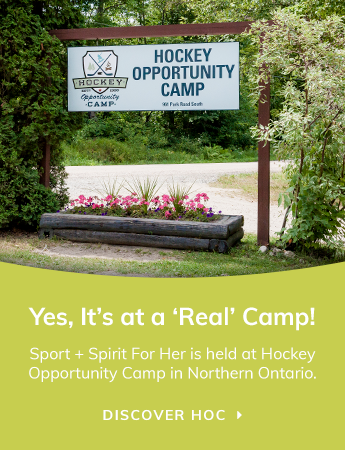 It's time for women to step outside their comfort zone and enjoy new fun ways to get in shape for the hockey season. There's always tons of fun on our biking trails! Participants of all ages and skill levels use rugged Giant Mountain Bikes as they learn how to safely navigate a variety of terrain – including hills and technical single track trails. It's 40 feet high – are you UP to the challenge? Our climbing wall is brand new – and is the perfect activity to get participants up and out of their comfort zone. With 3 unique climbing elements, you can find your own challenge at any level. Getting wet is the ONLY option – whether you're on skis or in a tube! Just because it's September, doesn’t mean the water isn’t warm(ish!). Get up on skis for the first time or revisit a familiar sport – try Two Ski, Slalom, Wakeboarding, Wakesurfing, Knee Boarding and even Tubing! Paddle your way at your own peaceful pace to uber fun. Participants are provided detailed instruction in paddling techniques, self rescue, balance and stability and marine safety. Many paddling games are played to challenge a participant's skill. Great for core strength & cross-training! Paddle Boarding is the combination of lakefront fun and agility. Learn to balance on your board and travel around the bay. Although it might be a difficult skill to master, paddle boarding is a fantastic core strength workout! Got a little Robin Hood or Katniss Everdeen envy? Why not try one of our most popular activities. This archery class teaches you how to safely use regulation bows and arrows to shoot at static targets. Take advantage of Hockey Opportunity Camps's exceptional instructors who can take you through key tactical strategies in a game setting. Come experience this all levels practice which includes yoga, meditation and self inquiry tools to help you create transformation and possibility.